Washington (AP) — Presidents past and present joined members of Congress from both parties and world leaders in mourning Sen. John McCain and praising him for a lifetime of service and accomplishments. Former Presidents George W. Bush and Barack Obama, who blocked the Arizona Republican’s own White House ambitions, are among those expected to speak at McCain’s funeral. McCain is expected to be remembered at ceremonies in Arizona and Washington before being buried, likely this coming week, at the U.S. Naval Academy Cemetery on a peninsula overlooking the Severn River in Annapolis, Maryland. President Donald Trump, who once criticized McCain for being taken prisoner during the Vietnam War, said his “deepest sympathies and respect” went out to McCain’s family. 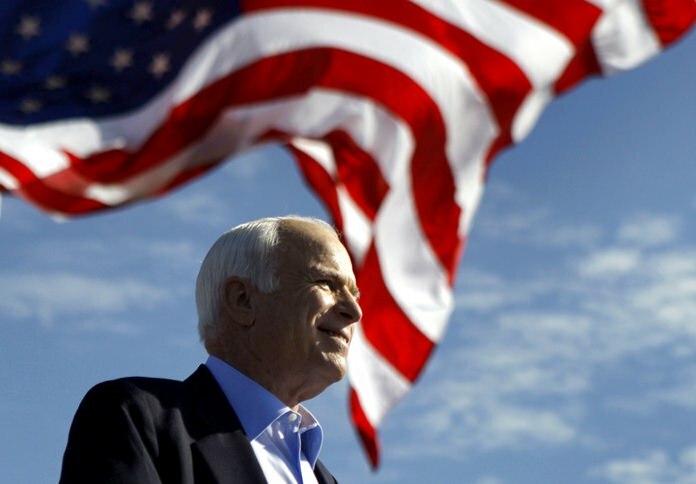 McCain, 81, died Saturday at his ranch in Arizona after a yearlong battle with brain cancer. A black hearse, accompanied by a police motorcade, could be seen driving away from the ranch near Sedona where McCain spent his final weeks. For 50 miles along Interstate 17 southbound, on every overpass and at every exit ramp, people watched the procession. Hundreds, including many waving American flags, parked their cars and got out to watch. Trump’s brief Twitter statement said “hearts and prayers” are with the McCain family. Trump and McCain were at odds until the end. The president, who as a candidate in 2016 mocked McCain’s capture in Vietnam, had jabbed at the ailing senator for voting against Republican efforts to roll back President Barack Obama’s health care law. Earlier this summer, McCain issued a blistering statement criticizing Trump’s meeting with Russian President Vladimir Putin. Other tributes poured in from around the globe. McCain was the son and grandson of admirals and followed them to the U.S. Naval Academy. A pilot, he was shot down over Vietnam and held as a prisoner of war for more than five years. He went on to win a seat in the House and in 1986, the Senate, where he served for the rest of his life. The Senate’s top Democrat, New York’s Chuck Schumer, said he wants to rename the Senate building that housed McCain’s suite of offices after McCain.